2 bedroom apartment sleeping 4 people just 3 minutes walk to the center of Hisaronu. HISAR GARDEN COMPLEX has one of the most sought-after locations in Hisaronu. This modern 2 bedroom apartment sleeps up to 4 people. All rooms have air conditioning, and there is a fully equipped kitchen which opens onto the main balcony overlooking the pool and garden. The apartment has everything you need for a stress-free holiday, so you can completely unwind and enjoy what this stunning area has to offer. 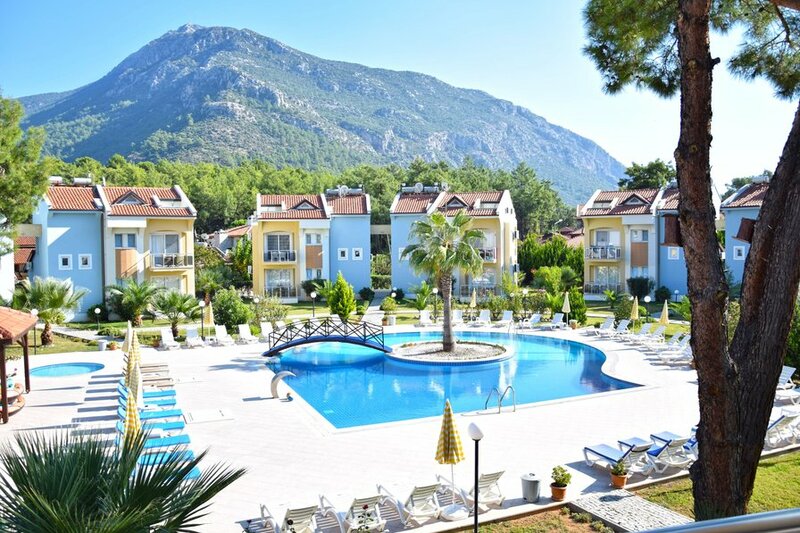 The complex has one of the biggest shared pools in the area (with a separate children's pool), which is set in beautifully landscaped gardens with stunning mountain views. The grounds have ample room for all guests to relax in without ever being crowded. There are also some big trees that can be used to find shade in the heat of the summer. Communal sun loungers are provided for all guests plus private sun bed cushions belonging exclusively to the apartment. There is also free unlimited wifi around the complex. Situated only 1 minutes’ walk from Hisaronu Town Centre, where you can find shops, restaurants, and bars, etc, it really is the perfect spot to spend your holiday!